The Wirral Hundred clubs now traditional mid-summer weekend (24th & 25th June) at Anglesey, using the 1.55 mile Coastal circuit on the Saturday and the 2.10 mile International circuit on the Sunday, saw it attract its largest-ever mid-summer entry with over 170 riders and a bigger crowd of spectators than usual. The total of 34 races took place in pleasantly dry and warm conditions, and whilst most of the winning was done by the usual front-runners, it was the various scraps for the next few positions which caught the eye. 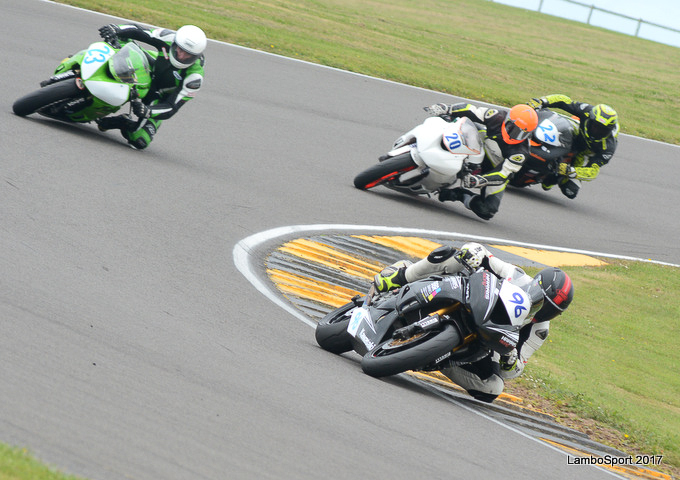 Once again the Paul Bland Motorsport Formula 600 class attracted nearly 50 entries, with the fastest 36 in qualifying practice seeded into the two championship races each day. Former champion and Anglesey resident Jamie Harris returned to W100 action for the first time this year and comfortably won all four races, this feat moving him up to third in the championship standings behind Jamie Devine and Adrian Kershaw, both of whom also performed impressively and were never out of the top five. Chris Jones had his best W100 meeting to date, culminating in 3rd and 4th positions on Sunday, whilst Chris Eden had two days to forget with two falls and some resultant technical problems. 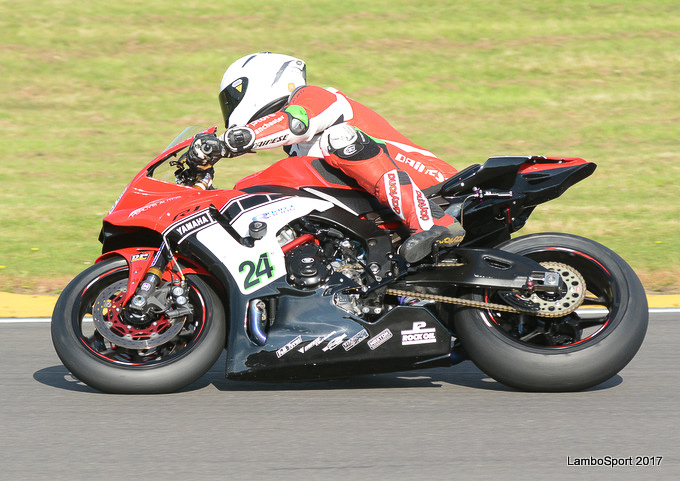 In the Powerbikes class, championship favourite Johnny Blackshaw maintained his unbeaten run with four victories. Chris Barnes followed him home on Saturday but a fall in his first race on Sunday put him out for the rest of the day, allowing Joe Ravenscroft and Matt Jones to chase Blackshaw home. 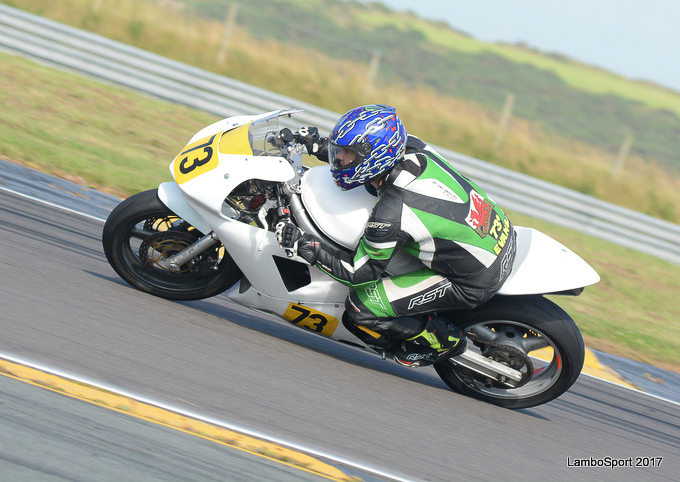 The afore-mentioned Jamie Harris, making his debut on a GSXR-1000, was quickly on the pace and achieved a best position of 3rd on Sunday. The club’s newly-introduced Pre-2009/Pre-Electronics Powerbikes category is gaining support and for this third meeting there was an encouraging entry of 19 riders; former W100 champion John Robb wheeled out his faithful 13-year old Suzuki, and scored four comfortable wins ahead of Chris Ganderton on his elderly R1, whilst Greg Lewis on his 750 Yam was the best of the Golden Era brigade. The Formula 600 and Powerbikes results could probably have been predicted, not so the SSR Suspension Golden Era Supersport class, where the two leading riders this year so far, Ray Stevenson and Dave Marsden, came up against Dean Osborne, yet another impressive Manxman with a win already in the Newcomers Manx GP, and Tim Bradley, many times a W100 champion in the past. Osborne had four wins and Bradley three 2nd’s and one 5th, but Stevenson and Marsden still did enough to stay top in the championship standings. 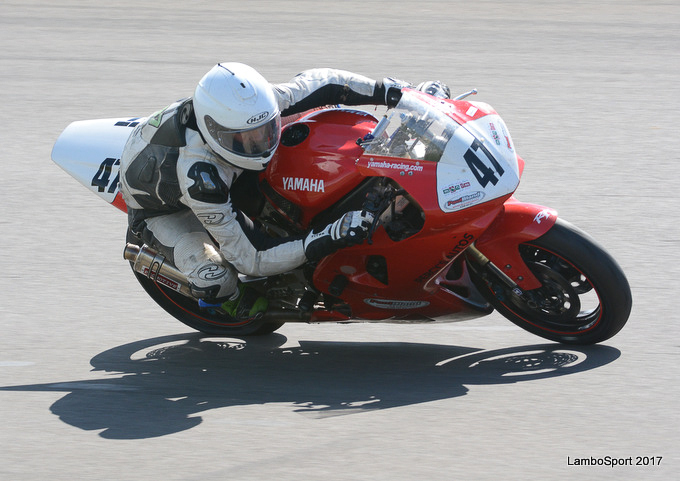 G/E Supersport shared track-time with the 650 Twins, and in this class Mike Bampton had three wins and David Evans one. F1 Sidecar Championship, put on impressive shows in each of the sidecar races; the 2016 W100 champions Michael Jackson & Cullum Crowe were 2nd on three occasions, whilst Craig & Kirsty Hauxwell managed briefly to overcome some technical gremlins to claim the other 2nd place. 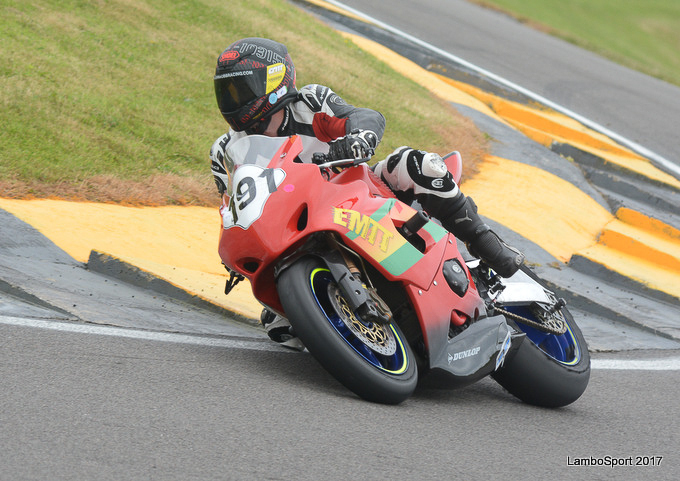 Just as at Oulton Park in April, the Earlystocks Racing Club were guests at this meeting and this time shared track-time with the Forgotten Era bikes. 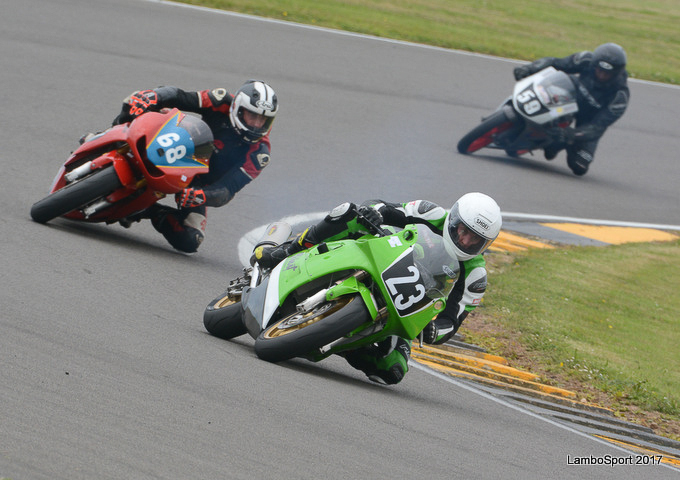 Andrew Howe (3 wins) and Michael Hand (1 win), both on GSXR-750’s, shared the honours this time around. At the end of each day, the Anglesey Senior and Lightweight Open races took place. 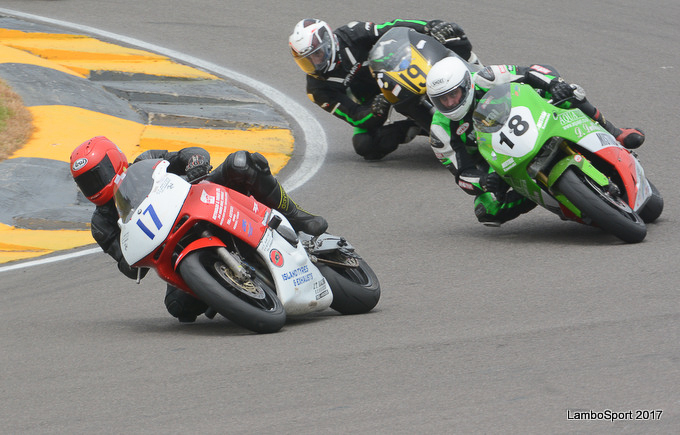 The Seniors saw the head-to-heads between Johnny Blackshaw on his R1 and Jamie Harris on his ZX6R. Hardly a fair contest in theory, but Harris gave it his best shot, and finished 2nd both times, both times ahead of Matt Jones. The meeting also saw the running of the Open postponed from March and this time Blackshaw won from Chris Eden and Jamie Devine. In the Lightweight Opens the wins were shared by Mike Bampton and David Evans, both on 650 Twins. The next Wirral Hundred meeting will take place on the Anglesey Coastal circuit over the weekend of 29th & 30th July. 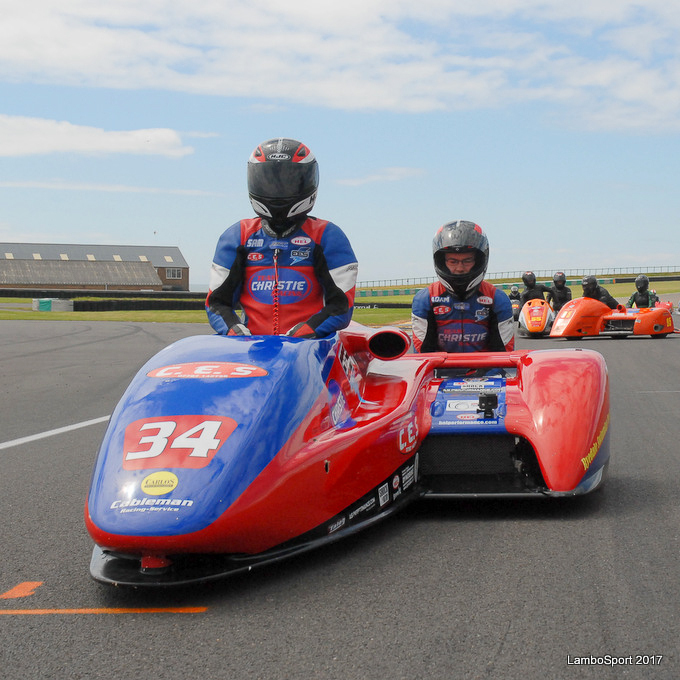 This will include a full complement of W100 championship races, together with rounds of the ACU/FSRA British Formula 2 Sidecar and FSRA Post-Classic Sidecar championships, together with the Classic Parades. W100 prides itself on its recent safety record at Anglesey, so Saturday came as a bit of a shock with 29 fallers and 6 red-flags in what were essentially good racing conditions. Thankfully sanity returned on Sunday. The initial prognosis was that no riders were seriously injured but it was odd that of the four giving us most cause for concern, three of them – Steve Beale, Gillin Chadwick, and Les Crowe - all hailed from the Isle of Man, whilst the fourth, Andrew Tait, came from way up in the far north of Scotland. Very strange geographically, but let’s hope that they are all back with us again soon. This came from a disabled spectator and ex-racer, Mr AF Lewis, who quietly gave the club £100 to be distributed amongst those riders, especially newcomers, not featuring amongst the award-winners. 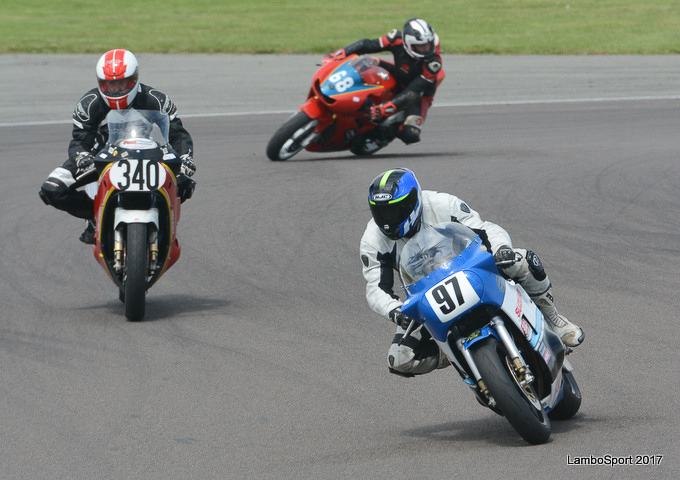 So three unsung riders in the 100-500cc Allcomers class shared the £100. Thank you Mr Lewis. All credit to the nine riders (and one passenger), who won four or more races across the weekend, but Top of the Pops was surely Dean Osborne from the IoM, making his W100 debut and dominating the Golden Era Supersport races on his steel-framer. Well done, Dean. This goes to a former W100 committee member Carl Roberts, now of course also resident in the IoM. Carl was the fastest 650 Twin in Saturday’s practice, stormed into the lead from pole position on lap one, lead at the end of lap one, had his throttle stick open at the Banking at the start of lap two, and wasn’t seen again. Hopefully he will return in July! In club racing we are all too aware that the regular winners and runners-up have an abundance of trophies stored away at home; how nice then when at this meeting we believe that eight riders collected awards from us for the first time – John Bain (twice), Sam Eckersley, Ali Foster, Chris Jones (twice), James Labdon, James Leatham, Clive Ling and Phil Munday. Well done, hopefully these awards will just be the beginning……. Sorry, but it is unprintable.